While biking home from work on Alta Drive Monday night, I confronted a nasty crack issue. One of the shorter and easier trails in the Las Vegas Valley area is the four-miler from the Lake Mead Natl Rec Area to Hoover Dam. Mostly flat along the mountain, offering you a ledge to see the lake on the way to Hoover Dam. It's the old rail easement and the tunnels make for great photos. Wonderful change of pace from road cycling with single-track mountain biking with Jason Bean in the Red Rock Canyon area. 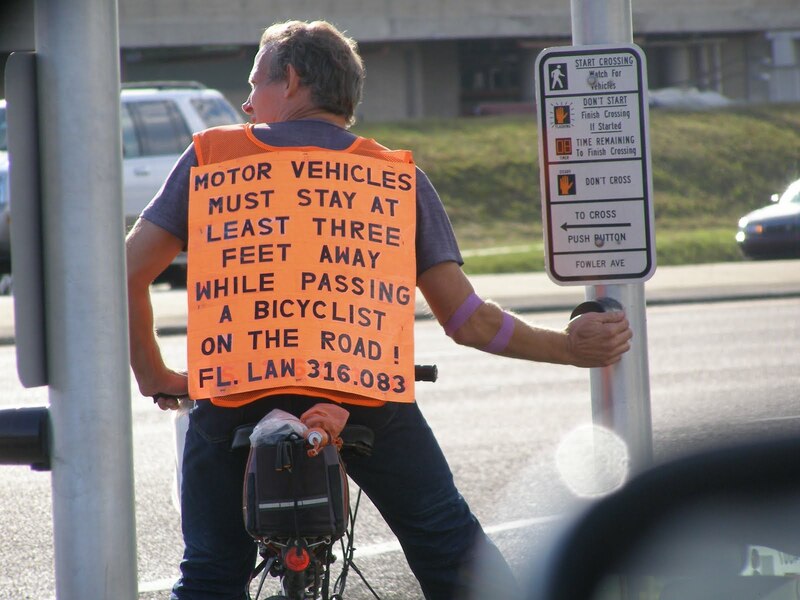 Still waiting to see this sign on a bicyclist in Nevada. 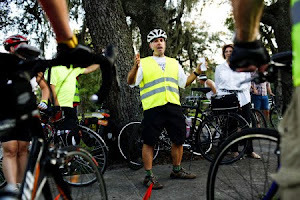 In Florida, the Department of Transportation's idea of a public safety campaign was to blame bicyclists for getting hit by motorists so bicyclists like this fella resorted to deploying their own public education program. 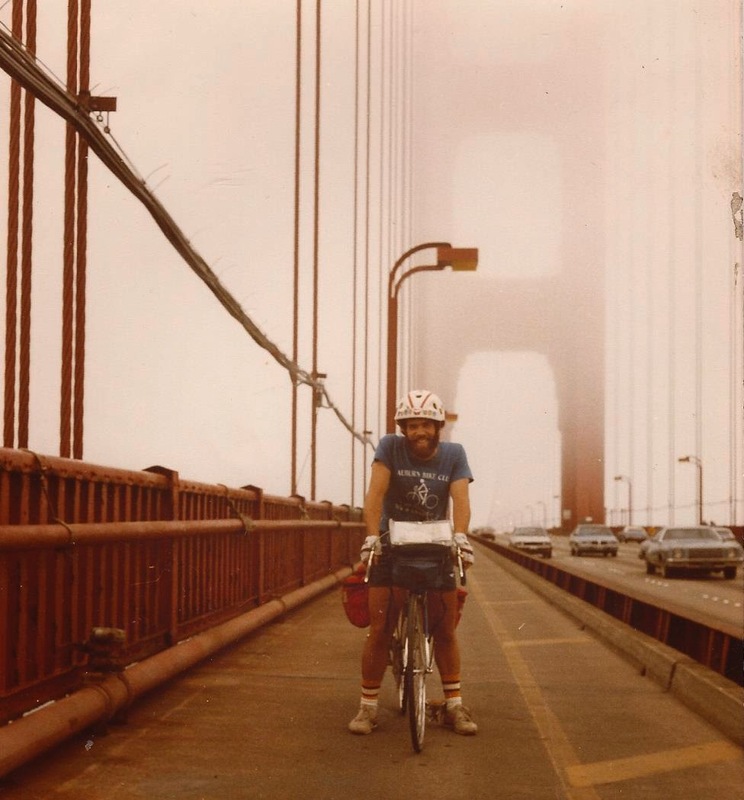 The beauty of bicycle commuting -- besides the money you save by not using a car and the health benefits and the exhaust you're not adding to the local air -- is that no matter how good or bad work is the day has some redemption because you biked to and from work. Plus, you never know who you'll meet while biking. On the way in to work, I met this fella, a BMX-riding hoodie guy who biked a good 15 miles round trip on this rig -- his wife's BMX bike. Then, on the way home from the Review Journal in Las Vegas, I met Martin, who bike commutes every day to and from his job at the Clark County office building where he handles business registrations. And further up Alta Drive near Rampart, I met a gaggle of cyclist. 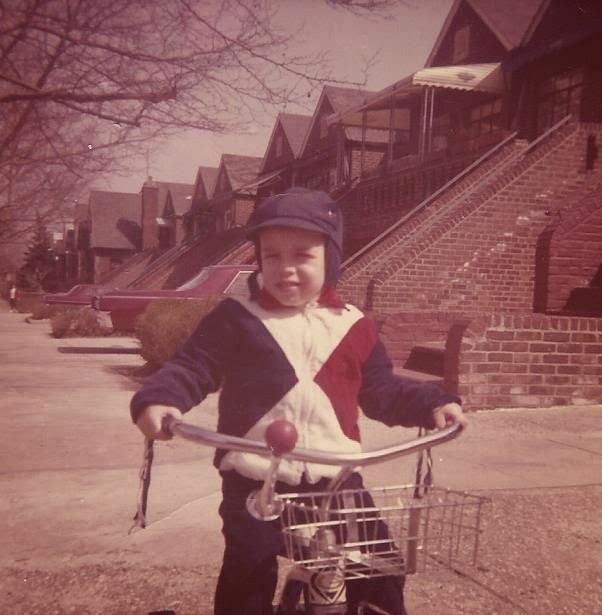 So, give it a shot -- bike to work. It'll make your day. While in the Monterrey area, I took a side trip to Santa Cruz to see the bicycle culture in that city. Love the Bicycle Trail bike shop, which took over an old carpet business and redeveloped the parking lot into a public bike commons. The bike culture on the streets is incredible. Loved the Seacliff State Park pier a few miles south of Santa Cruz. 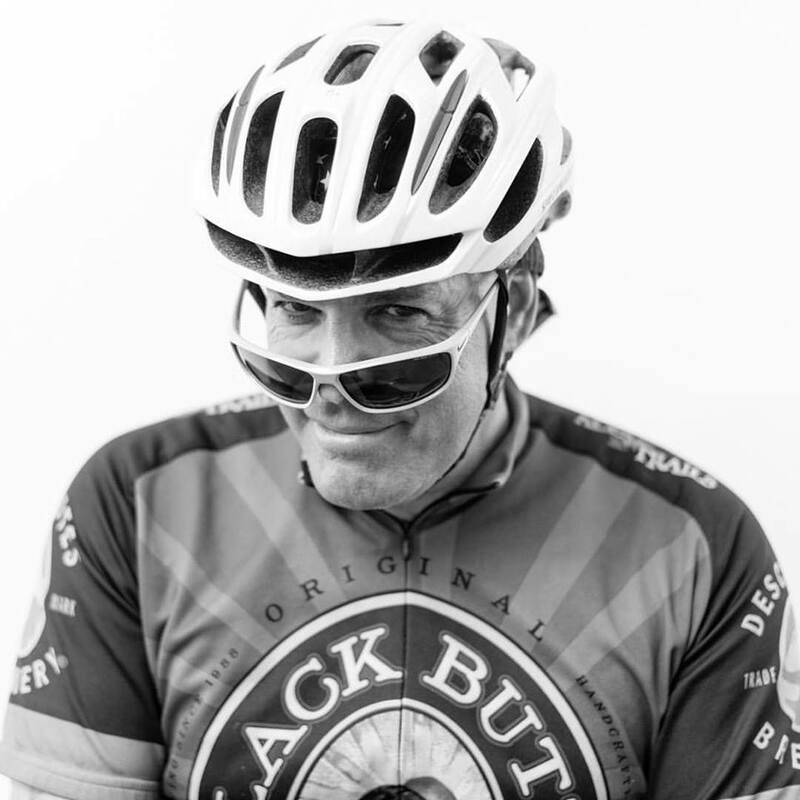 The 23rd Sea Otter is America's biggest celebration of bicycling, with 50,000 bike visitors, 8,500 competitors and hundreds of exhibitors. It all began when a local bike shop owner wanted to have a mountain bike race. Now, the event in April draws tens of thousands to the Laguna Seca Recreation Area, about eight miles off the Pacific Ocean in the hills overlooking Monterrey. Let's see the action. The guys at the SRAM tent. Today I took the mountain bike this afternoon and headed to Bistlecone Trail near the end of Nev 156 near the top of Mount Charleston. I parked in the lot and biked uphill more than three miles along a packed road of dirt, rocks and gravel. Only saw six hikers the whole way. It was about 70 degrees or so -- warmer in the sun but plenty of snow up there. It looked like California or Colorado, but it was metro Las Vegas. I was impressed with all the regular guys and gals rolling out on Nev 159 in Red Canyon this morning. The guys in the matching shorts-jerseys just hammer, but dozens of happy smiling bicyclists wearing all types of gear and riding all types of bikes were waving and having a good time. 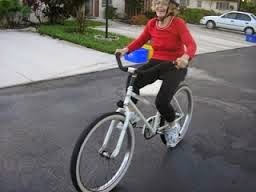 They must be getting ready for next weekend's Summerlin bike ride. Skipped the Red Rock scenic loop and pedaled 159 to Blue Diamoind -- a small cluster of homes with a school, ballfield, market -- and of course, a bike shop. The River Mountain Trail is a 34-mile loop around a mountain outside Las Vegas, which includes the route going through Henderson, Boulder City, Lake Mead and Lake Las Vegas. I usually follow it in clockwise fashion. But today I did the roller-coaster trail in counter-clockwise fashion, which included lung-gasping steep hills and super high winds and left me feeling like I biked 100 miles in Florida. I saw this bicyclist wearing work boots pedaling a heavy rig up a big grade into the wind and always amazed at the zig-zag design of the trail up and down the mountains, especially between Lake Mead and Lake Las Vegas on the other side from Henderson and Boulder City. I loved the double tunnel at Lake Mead and the section in the powerline public right-of-way. One of the most amazing diverse trails in America with stunning views. Long red lights are the perfect setting to snap a photo of people or artwork within range. This week as I rode down Alta Drive to work, I snapped shots of artwork (that's not a real cactus) at the Valley View intersection and a work crew at the Rancho corner. Tonight I saw some good news and some bad news on my bike commute home. 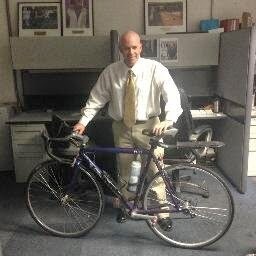 Here's a bike commuter named Chris, who pedals home from his water authority job. A few months ago I met Chris when it was dark on the bike commute home and he was sans reflective vest and bike lights. I advised him to wear the vest and get lights on the bike. It was nice to see Chris heeding my advice when I saw him tonight. But about five miles up the road on Alta Drive, I saw police gathering info on a car that hit a bicyclist west of the Rampart intersection. Las Vegas police officer told me, "He got banged up but he should be OK."
It's nice that all the DOT and safety people always advise bicyclists on how we should drive our bicycles. How about they also advise motorists that they should not hit bicyclists?